On our second full day in Johannesburg, GLCM had the pleasure of being hosted by global construction management and consulting firm Turner&Townsend. We began the morning in their main South African office in Johannesburg which was near our hotel. There Ian Donaldson, Managing Director of the African business unit, gave us an overview of the company. Turner&Townsend was formed in the United Kingdom in 1946, and expanded to Johannesburg in 1982 by entering the quantity surveying side of the mining business. While still having a major hub in the UK, they have expanded globally over the years to now having over half of their work outside the UK in 130 countries, including expanding to Australia and the US in 2000 with offices in New York, California and Chicago. The company pursues work in the infrastructure, hospitality, oil & gas, mining & metals, commercial and residential markets. The company employs 4,500 people in 90 offices that are currently operating $500 billion worth of projects, focusing on high-profile, long term clients. 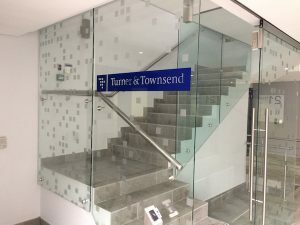 Turner & Townsend does not do any design or contracting work, but focuses on project management and controls. During our introduction Turner & Townsend managers explained to us the unique challenges and opportunities of operating in the African construction market. One point they stressed was that Africa is often a “forgotten continent,” being pushed off to the side of world maps in the US while in fact it is centrally located on the globe – practically equally distant from North and South America, Asia and Europe. It was also noted hat many non-Africans perceive the continent to be much smaller than it is, when in fact there is a vast amount of resources and people in the region. They also explained that in the future, especially in our young careers, Africa presents a huge opportunity with the need for infrastructure such as ports, roads, and rail. They also wanted to dismiss the misconception that Africa needs to develop better technology. Generally, the system exists already somewhere in the world – being designed in the US and fabricated in Asia for example, but the challenge is “Africanizing” the project: for example having an adequate tower crane at the port to unload the materials and having appropriately trained staff and workers to deliver and install the system. After our office visit we were taken to the Gautrain O.R. Tambo International Airport Platform Extension by Noluthando Molao, Associate Director at Turner & Townsend and the company representative for the project. The Gautrain is the mass transit rail system for the Guateng province, which includes Johannesburg and Pretoria. The O.R. Tambo International Airport serves as one of the final hub destinations for the rail system. The system operates on a 20-year concession to the Bombela Operating Company. The scope of the project includes extending an existing station platform at the airport an additional 55 meters. This will allow passengers to disembark from 4 rail cars increased from 2 in the current configuration. There are many distinct factors to this project that mandate a heightened influence on safety and planning. One requirement of the project was that the rail service to the station must be maintained throughout the project. This required the general contractor, Stefanutti Stocks, to only operate on one side of the track at a time. This required erecting a temporary barrier that only sits 0.5m from the operating train. Because of this proximity to live trains, passengers, and an international airport, saying safety is paramount to the project team is an understatement. The trains operate at 25,000 volts reaching speeds of up to 160 km/h. With that amount of voltage a person can die while only coming within 3m of the catenary wires above the live tracks. To keep both the public and the site safe, barriers needs to be securely erected at the existing platform and physical spikes to stop trains that have run on the wrong side of the track due to human errors are put in place, along with extensive training and safety orientation sessions. The project is also unique in regards to site logistics and construction processes. All work occurs 18m above ground on existing elevated train viaducts that were built for the original Gautrain station. The original design included points for future expansion of the platform. This is where steel brackets are bolted to the existing viaduct. 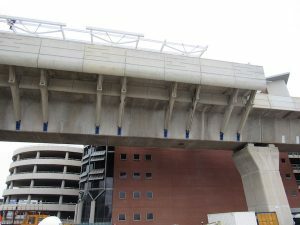 Then precast concrete struts that support the platform are bolted onto the brackets. These struts identically match the existing structure and were prefabricated at the time of the original construction and stored in such a way that they are able to be used over 5 years later on this project. Then new precast reinforced concrete slabs are lifted into place on the struts, followed by a pre-assembled steel superstructure above the platform. The same process must then be repeated on the opposite track side. This is necessary in order to ensure that the existing viaduct does not risk collapsing due to eccentric loading being greater on one side of the structure than the other. Displacement of the viaduct is constantly monitored by ruler and level to ensure this is not occurring. The switch-over of the equipment and safety barrier takes two nights of working from 11pm to 3am when trains are not operating since this requires a complete shutdown of the electrical system. This will occur again when tile flooring, electrical lighting, signage and other systems are installed. Even the final finish of the flooring, which must be 65mm away from the moving train in the final condition, must account for this rotation and the post-tensioning of the structure. 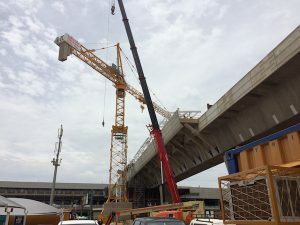 In order to accomplish the erection of the large precast reinforced concrete components, the largest tower crane in the continent of Africa is being used on the project. This French crane has a capacity of 32 tons at a radius of 27.8m and 20 tons at 40m. The crane is currently set up at half the maximum height of 82.6m to handle the large loads – which reach 18 tons for the struts and between 20 and 25 tons for the slabs. The crane costs R500,000 per month to lease, about $30,000, which is a 50 percent reduced rate from the norm. The crane would cost R24 million to buy outright, or $1.45 million. 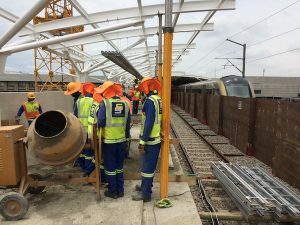 Labor on site is at 45 workers, and set to increase to 60 soon coming off of a 3 week paid holiday break that is taken by all companies in the construction industry in South Africa. This is to allow workers who leave rural families behind to work in the cities to see their families and take a well deserved rest. 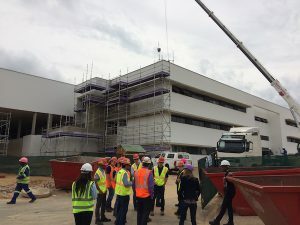 After a delicious lunch of burgers, wings and ribs at Rocomama’s, Turner & Townsend Business Development Director for the buildings sector Jacques Jacobs toured us around the Long Lakes Private Hospital project. 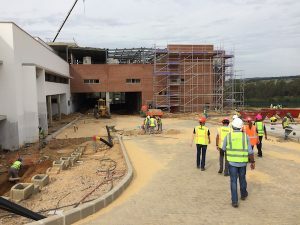 This 3 floor hospital being built by general contractor Group Five is a R330 million ($20.1 million) privately-funded facility. It is a typical reinforced concrete structure building being built essentially as a shell for the owner who will provide their own furniture and equipment for another R300 million on top of the construction costs. This is a relatively new private healthcare group that is somewhat new to to the building process. This has caused some unforeseen changes during construction that has been a unique challenge for the project team. The current schedule of 14 months may be extended by an additional 2 months because of the circumstances, and may extend further if the hospital group decided to add additional scope of a doctor’s office wing to the facility. The project is expected to be completed in April or possibly later if the new section is approved. Mr. Jacobs described to us that the building was being constructed as would any other typical commercial building with state of the art procedure rooms and equipment. The building is a concrete structure with plaster perimeter walls and drywall interior walls, along with dropped tile ceilings and vinyl or tile floors. While many parts of the building did feel very conventional, some aspects of the construction were noticeably different from what many of us had seen in the United States – for example plaster walls over red clay bricks and mortar in the absence of the more common CMU used in the US. Mr. Jacobs explained the clay brick is readily available, cheap and acceptable while CMU is used very rarely in South Africa. 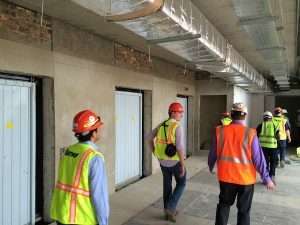 Some of the unique parts of the building included deep ceilings for completely above-ceiling mechanical equipment and a backup generator with an uninterrupted power supply that can switch over critical systems during a power outage in 3 to 4 seconds. Another unique feature is an oncology unit that was constructed with 1-meter-thick steel plate and concrete walls, floors and ceilings to prevent the spread of radiation. Although this method of radiation containment is very rudimentary, the designers and owners felt it was worth the potential cost reductions, which turned out to not be the case once the lead time for the embedded steel plates was found to be very lengthy, adding this activity to the critical path. 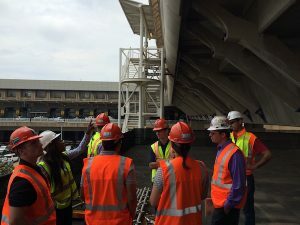 Mr. Jacobs stressed the importance of getting the construction management team integrated into the project early with the designers, owners and other stakeholders in order to rule out potential issues and create a seamless project delivery. 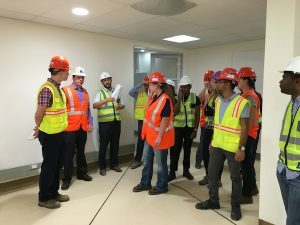 We concluded our visit with a tour of the operating rooms with ceiling structure in place for robotic machinery, the kitchen spaces and rooftop mechanical equipment. Turner & Townsend were very gracious to show GLCM a side of South African construction that was both similar and different in many ways to practices we are familiar with in the United States, allowing us to relate to many aspects and learn about cultural and practical differences in the market. We now look forward to our final day of construction related tours tomorrow after a very productive week in Johannesburg.